“How’s Lesley doing?” queried my editor yesterday, after I’d submitted the Alpine High entry. Yesterday, the temperature easily broke 80 and with crystal clear blue skies, there was plenty of sun. Too much for me, in fact, as I could never find my legs during our second session and lost two out of three mixed doubles sets. But Lesley grew stronger as the day went on, and by afternoon’s close, she and her partner Saniya were able to take a set off Anita and teaching pro Lucinda Gibbs, the only female pro on the staff. “Make sure you point out we’d played like rubbish until then, and with Anita’s friends cheering her on, we were shamed into playing better,” Lesley noted. In other words, Editor Cox, Lesley is doing well, very well. Bussing down to the lower courts had first seemed a bit like having to eat at the children’s table, but as the week wore on, it promised some of the most enjoyable play. Typically you were no more than a group of four, and you weren’t bothered by balls coming from another court, or onlookers—kitchen staff, guests, non-playing spouses—kibitzing (though truth be told, no one kibitzes louder or more distractingly, than Emmo … and I mean that in a collegial and team-building way, Roy). This morning, rallying with Lucinda, was about as good as it gets. 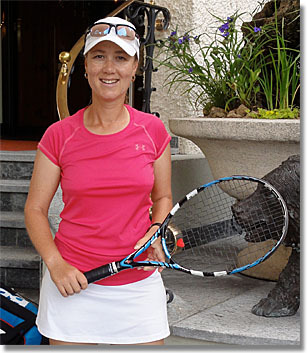 Our only female pro, Lucinda Gibbs takes no prisoners … except when playing Lesley. The daughter of a sports journalist in Cape Town, South Africa, Lucinda was one of her country’s best juniors and, in her late teens, best women at a time when her tennis federation threw all its support to the men. “I was the number one woman in South Africa at 18,” she told, as we took a break. “But there was no money for us. 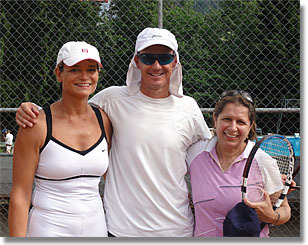 Liezel Huber and I played many times as juniors, and I never lost to her in doubles, no matter who I played with. Today, she’s ranked number one in the world in doubles. She came from a rich family, she always had a coach, and at home, there were four courts in her back yard. For me, I had to at least make the semi-finals in singles to have enough money to travel. And money in doubles? Forget it.” Lucinda’s world ranking had peaked at 250 in doubles, and around 400 in singles. Which was why she was here, hitting with me. “Maybe not,” she snarked back, aiming at my navel. Tennis, it’s a tough business … for both of us. Up the hill at the Palace courts, Lesley was getting more coaching from Emmo, “specific tips to improve our serves,” she told me. “For example, where and how we were tossing the ball, and how to toss more consistently, which is a problem for me.” I began to hear, in the way she now spoke of the sport, an understanding that hadn’t been there when we’d left the States. And I began to wonder, given that we had yet to be on the same court together, exactly how much had my wife improved? When I learned, at day’s end, that she and her partner had taken a set off this same Lucinda, I wondered even more. My afternoon session hadn’t been quite so stirring. In a mixed doubles mini-round-robin, my partner (the human backboard) Amber and I eked out a tie-break win over Kelly and Sri, who I have now learned is one of those high-tech pioneers who cashed out ahead of the recession, and now owns a commercial avocado farm that he rarely visits, just west of Malibu. Yup, that Malibu. Sri lives in India. Oh yeah. Fabienne and her partner Steve, a private chef who lives in London but used to prepare fish dishes at Citronelle in Washington, DC—only in … oh, never mind—made quick work of us, as Amber’s back began to spasm and my brain to cramp. We were still alive for first place, though, when we took on Steffi (she of the he’s-not-dead-he’s-sleeping-give-me-a-blanket travel tale) and Antony, whose last name I might remind you, is Emerson. Emersons don’t like to lose, I’ve discovered, even to clients. Or, perhaps, especially to clients. 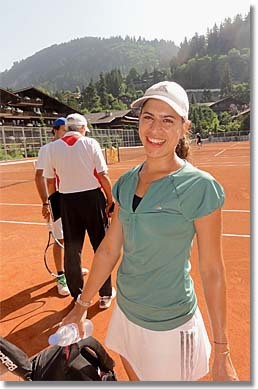 But the dagger to the heart was that I was outsteadied on match point by … Steffi. I felt like taking a nap. Just not next to her. When evening came, we ate on the Palace terrace—Lesley, Fabienne, Amber, Saniya, Steffi and me. The women shared tales of motherhood, sisterhood, parenthood, and childhood. I enjoyed the neighborhood.